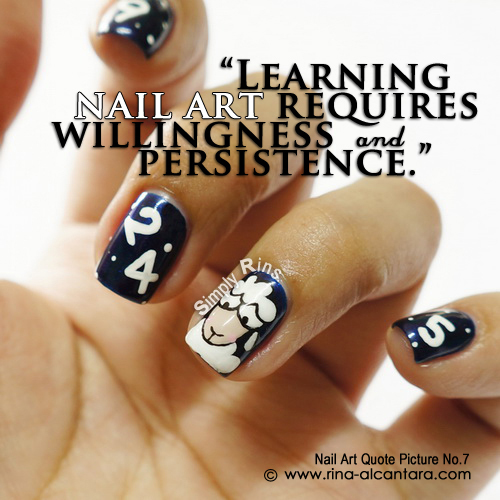 "Learning nail art requires willingness and persistence." I never thought the day would come that people would ask me to teach them how to do nail art or give them personal tips. My mother always reminds me to share one's blessings and so I try my best to impart what I love to do -- nail art designing. In my attempts to help others, I've encountered people that are easily let down by disappointments. I tell them that willingness to learn nail art is the start, but it is not enough. One should also be willing to endure the frustrations that comes with learning. One must have persistence. It's always hard during the first time, right? Your nail art skills will eventually develop through practice, practice, and more practice. I adore this tyring to sleep mani - it's so sweet!